Clay Pot Cooking is an easy & natural process, and once you are used to it it's so hard to go back to conventional cookware. Most important, we are providing healthy benefits and taste to our family. Clay pots are naturally non-stick so food gets cooked with little to no oil. 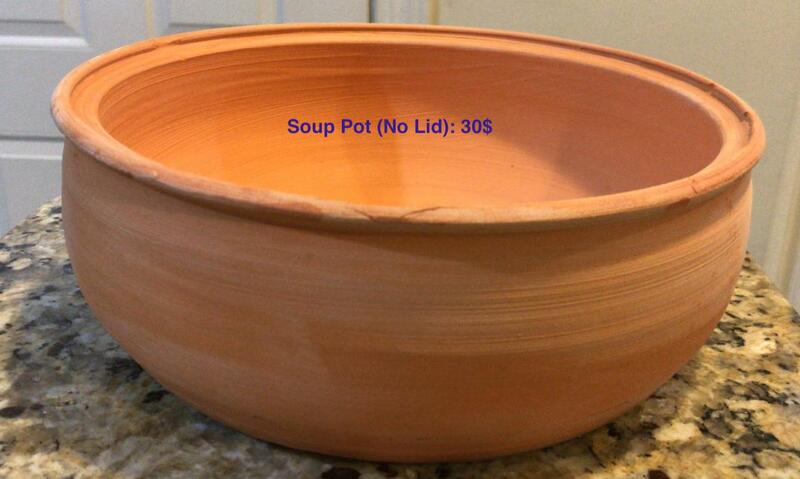 Please do not expose your natural clay pot to quick changes in temperature. Heat slowly, add room temp ingredients, and do not shock your pot! You will need to "season" your cookware in order for it to remain durable and prep it for years of use. To do this, soak the cookware overnight in a large vessel of water. Remove form water, dry with a towel and set aside until completely dry. Once dry, rub entire vessel with oil, (olive, coconut...) fill 3/4ths with water and place in cool oven, Turn oven to 350. Once the oven reaches 350, heat for 3 hours, then turn oven off and allow cookware to cool down in the oven. Once that is complete, wash cookware by hand with mild detergent and it is ready for use. Before first use, thoroughly rinse the pot and lid under running water, then drain water off. Wipe the bottom with a cotton cloth. Then fill the pot quarter way up with water, place it on the stove, cover with lid and start on low heat for 5 minutes. Sprinkle 1 tbsp. of flour to the water stir, cover, and let it cook. Increase heat to medium after 5 minutes. Make it 2 tbsp. for Large and X-large pot. The flour can be any of your choice – rice, wheat etc. and for gluten free options, you can use chickpea flour, oatmeal etc. Cook this mixture on medium heat till it thickens to a broth (consistency of a juice or slightly thicker). This process takes 25-40 minutes (time varies depending on the flour used), check accordingly. Turns stove off and wait for it to cool down, preferably overnight. The next morning, pour the broth out, scrub & wash off any residue from the seasoning. Wipe the pot dry, apply a coating of cooking oil on the outside walls before cooking. By following these few simple steps, you can have a pot that lasts for a long time cooking delicious food for you: 1. On stovetop when cooking for the first few times, start on 'low' then increase to medium in 5-7 minutes. Once seasoned and used a few times, you can start on medium heat. If need be, you could increase heat slightly past medium, avoid high heat. Primarily clay is an excellent retainer of heat so all food cook perfectly just on medium heat in just about the same time. Once the pot gets cooking, sometimes you will find that you have to reduce the temperature back to low. because all the heat is held inside. 2. After the first seasoning use it as often as possible for a few times cooking 'wet' recipes. Use it at least 5-6 times before using it for sauté. 'Wet' recipes include making rice, pasta, lentils, vegetable stews etc. 3. Using a heat diffuser is recommended for all cook-tops, and is a must use if cooking on electric stoves (Coil, glass or ceramic). Although dishwasher safe, hand washing recommended. They’re easy to clean because they are naturally non-stick. Due to clay being porous, It’s best to avoid harmful, toxic soaps. Wash: get the pot wet thoroughly, sprinkle baking soda, scrub and rinse off. Wipe it with a cotton towel and allow it to dry. Getting rid of burns: Food very rarely sticks to the bottom. If you've accidentally overcooked or burned food, pour some warm water in the pot, sprinkle baking soda and let it sit for 10 minutes and then scrub with sponge. The food would come off the bottom easily. Rinse the pot well and allow it to dry. For tough to clean spots, you can use harder scrubber. Storage Store with the lid open and in a well-ventilated place. Avoid storing in closed or damp areas. Once in a while (may be every 2 months), it's also a good idea to dry your pots on the stove top at the lowest setting for 5-10 minutes or until the rim is warm to touch. Cook-time: The food will be cooked fast on clay pots as it naturally retains all the moisture and oil, all on medium heat or less! Let hot clay pots sit on cotton pads or wooden board. Clay pots are refrigerator safe. Allow them to get to room temperature before heating up on the stove. For Best Taste: Use separate pots for making yogurt, one for teas/coffee & other herbal decoctions, all other types of cooking can be done in the same pot. Cooking vegetarian recipes in the beginning is recommended. After 5-6 times of use, you can cook both vegetarian and non-vegetarian recipes in your pots. Using separate pots for vegetarian and Non-vegetarian cooking is recommended. Wooden spoons go well with clay pots. Naturally Non-stick. Most of the steam/moisture & oils in the food remain in the pot so a lot of times little to no additional oil/water are required. Getting black on the Bottom. With use, the bottom of your pot will become black or gray. This is WILL NOT affect the functioning. It happens as a result of a normal oxidation process as would happen with any 100% organic matter like wood, stone etc. (when heat is applied). Avoid dry or oil sauté till pot is used 5-6 times. When sautéing onions or spices in oil, do so for just a few minutes, with lid on. They get cooked much faster in clay. Avoid sudden, extreme temperature changes: Example: If taking out of the fridge, let it come to room temperature before putting it on the stove for reheating and vice-versa. Use Heat Diffuser to evenly distribute the heat from your stove. A diffuser made of cast iron, steel or aluminum works great. All of these instructions will come as part of your order as well. © 2017 Welcome To Claycafe. All Rights Reserved.